Javier has 16 years of experience in mid-market M&A and VC, with 35 completed transactions and hundreds of others evaluated and negotiated. Reps and warranty insurance: What is it? Reps and warranty insurance is a contract between the buyer (or the seller) and an insurance company whereby the insurance company will indemnify the buyer for loss resulting from a breach of reps and warrants. It provides sellers with a powerful tool to shift the risk of financial loss arising from breaches of reps and warrants to the insurance company, giving the sellers certainty over sales proceeds and delivering the buyer a number of strategic benefits. Representation and warranty insurance has been around for more than 13 years; however, in the last five years, their use has increased significantly. There are four key elements of a policy: (1) policy limit or coverage, (2) retention, (3) survival, and (4) exclusions. Pricing is composed of two elements: the premium and underwriting fees. The premium is expressed as a percentage of the policy limit or coverage defined above. Currently, premiums are running at 2.5% to 3.5% of the policy limit or coverage. Underwriting fees are running at between $15,000 and $30,000. Most policies are bound—however, if not, the buyer should add a condition to close that ensures the availability of RWI as of closing. Sometimes, sellers remain liable for certain negotiated liabilities above the RWI policy coverage amount. If this is the case, indemnification provisions should require the buyer to seek indemnity payments from RWI policy before seeking payment from the seller. If the seller is responsible for any losses that are not covered by the insurance policy, it should propose language requiring the buyer to use a minimum level of effort to pursue claims under the RWI insurance. For many business owners, selling their businesses is the end of a lifetime project and the beginning of a transition to a new chapter, whether it is retirement, a new lifestyle, the start of a new business, or securing funds for their children’s’ college. For them, being able to receive the purchase price proceeds sooner rather than later is often critical to achieving their goals. For private equity and venture capital funds, selling their portfolio firms to maximize returns is their business, and being able to distribute the purchase price proceeds to investors sooner rather than later is critical to their success. A common denominator, therefore, among all sellers, is the desire to receive the purchase price proceeds as soon as possible. In this context, sellers have struggled over the years with the common practice of holding a significant portion of the purchase price proceeds in escrow to cover potential liabilities arising from breaches of representation and warranties. 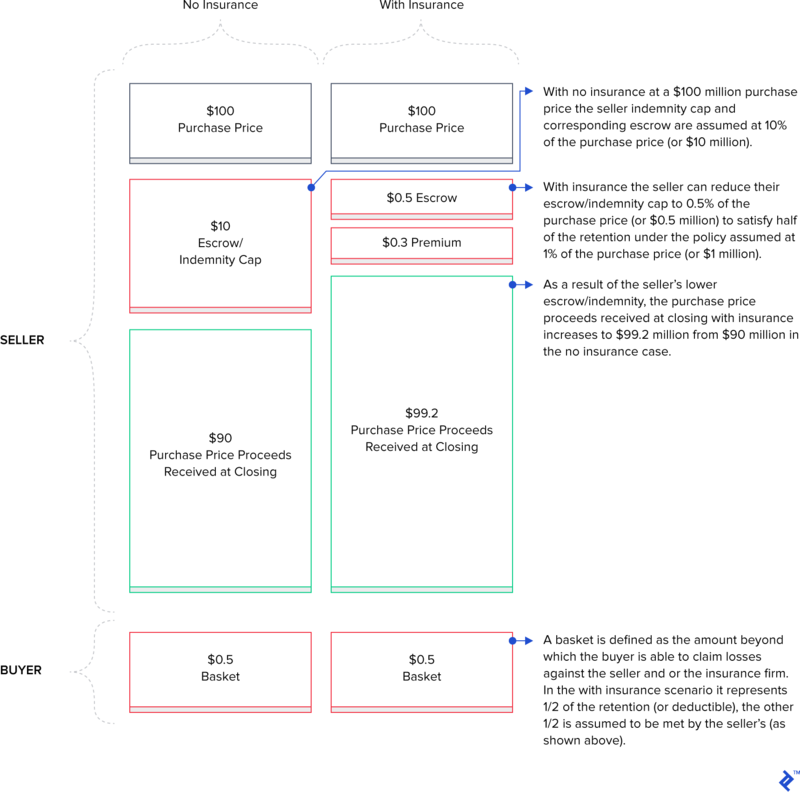 Fortunately, over the last five years, the forces of financial innovation have perfected a tool, namely representation and warranty insurance, that shifts the financial risk for breaches of representation and warranties to an insurance firm and in turn enables sellers to receive all the purchase price proceeds at closing. Representation and warranty insurance has been around for more than 13 years; however, in the last five years, their use has increased significantly. As a result, my work with clients has seen a strong uptick in their usage, prompting me to write down my thoughts and experiences with these instruments. This article is the first of a two-part series aimed at educating readers on what representation and warranty insurance is and how it works, followed by an overview of the drafting process. Before understanding what representation and warranty insurance is, it makes sense to go over what representation and warranties are. Imagine that you’ve purchased a machine learning technology business, and a month after closing, you discover that the two founders who are the brains of the operation and have created all the intellectual property had an ongoing legal dispute (which started before the closing) over how to distribute the excess cash. And imagine that, as a result of this dispute, one of the founders is threatening to leave the firm, which causes enough turmoil that certain key clients decide to take their business elsewhere, which results in the business losing 50% of its revenue. Or, you discover that the company had been withholding income tax from its employees but not remitting that money to the government. Most people would agree that the risk (and negative consequences) of the above circumstances should be borne by the seller—after all, the circumstances arise under the seller’s watch and as a consequence of the seller actions (or more often inaction). Representations and warranties (reps and warrants from now on) are contractual tools which allocate the risks of unknown conditions and circumstances to the seller. They are past and present (and future) statements of fact made by the seller about the conditions and circumstances of the business. In practice, reps and warrants are contractual statements whereby the seller asserts the truth and accuracy of a condition or circumstance of the business as of a given time. They are assurances made by the seller that help determine the quality, nature, and risks of what is being acquired. If these statements are not true, the seller may be liable to pay damages to the buyer who relied on the statement to consummate the transaction in order to compensate the buyer for losses incurred as a result of the false statement. Buyers seek reps and warranties to support their due diligence exercise as it has limitations both in time and scope. Particularly, buyers seek reps and warranties to obtain protection against unknown circumstances. Below is an example of the representation and warranties section in a purchase agreement. Click the button to show all six items. Organization: The Company is a validly existing, duly organized corporation in good standing in the State of ________, has the power to conduct its business in the current manner, and is qualified to conduct business in all jurisdictions in which the location and character of assets owned by it, or in which the nature of its business transactions requires qualification, or in which failure to so qualify would have an adverse material impact on it. To the Company's knowledge, no penalty or proceeding is pending or threatened in which it is alleged that the nature of the Company's business necessitates qualification in any additional jurisdiction. Authority: The Company has full authority, power, and rights to enter into this Agreement and into each document, agreement, and instrument to be executed and delivered by the Company pursuant to this Agreement and to carry out all transactions contemplated hereby and thereby. No consent or waiver of any person is required in connection with the delivery, execution, and performance by the Company of this Agreement, and each document, agreement, and instrument to be executed and delivered by the Company pursuant to this Agreement. Capitalization: The Company's authorized capital stock solely consists of ________ shares of common stock, of which ________ shares are issued and outstanding, and ________ authorized shares of preferred stock, of which ________ shares are issued and outstanding. All the Company's shares are owned of record and beneficially by the shareholders in the amounts set forth in the [attached schedule]. No outstanding dividends exist, current or accumulated, due or payable on any of the Company's capital stock. Any stock to be issued to the Acquirer is, and when delivered pursuant to this Agreement will be, (i) duly authorized, validly issued, and outstanding; (ii) non-assessable, fully paid and free of pre­emptive rights; and (iii) free and clear of any and all restrictions, pledges, charges, claims, liens, encumbrances, security interests, or other interests of third parties of any nature whatsoever. As of the date hereof, there exist no outstanding warrants, options, rights, agreements, or commitments of any kind for the issuance or sale of, or outstanding securities convertible into, any additional shares of any class of the Company's capital stock, and there exist no voting agreements, voting trusts, proxies, or other instruments, agreements, or undertakings with respect to the voting of any Company stock to which the Company or any of its shareholders is a party. Financial Statements: The Company's financial statements present fairly the Company's financial condition on the dates upon said statements and the results of its operations for the periods thereby covered and will be prepared in accordance with generally accepted accounting principles and practices consistently applied and consistent with the Company's accounting books and records. Litigation. There are no lawsuits, actions or administrative, arbitration or other proceedings or governmental investigations pending or threatened against or relating to the Company or the Company's properties or business. The Company has not entered into or been subject to any consent decree, compliance order, or administrative order with respect to any property owned, operated, leased, or used by the Company. The Company has not received any request for information, notice, demand letter, administrative inquiry, or formal or informal complaint or claim with respect to any property owned, operated, leased, or used by the Company or any facilities or operations thereon. The Company has not been named by the U. S. Environmental Protection Agency or a state environmental agency as a potentially responsible party (or similar designation under applicable state law) in connection with any site at which hazardous substances, hazardous materials, toxic substances, oil, or petroleum products have been released or are threatened to be released. There are no existing or, to the knowledge of the Company, threatened product liability, warranty, or other similar claims, or any facts upon which a claim of such nature could be based, against the Company for services or products which are defective or fail to meet any service or product warranties which could reasonably be expected to have a material adverse effect on the Company. Compliance with Laws. The Company is not in material violation of any laws, rules, or regulations which apply to the conduct of its business or any facilities or property owned, leased, operated, or used by the Company. There has never been any citation, fine, or penalty imposed, asserted, or threatened against the Company under any foreign, federal, state, local, or other law or regulation relating to employment, immigration, occupational safety, zoning, or environmental matters and the Company is aware of no current circumstances likely to result in the imposition or assertion of such a citation, fine, or penalty. Reps and warrants insurance (RWI from now on) is a contract between the buyer (or the seller) and an insurance company whereby the insurance company will indemnify the buyer for loss resulting from a breach of reps and warrants. It provides sellers with a powerful tool to shift the risk of financial loss arising from breaches of reps and warrants to the insurance company, giving the sellers certainty over sales proceeds and delivering the buyer a number of strategic benefits. While it is always a breach of the seller’s reps and warrants that is the trigger for coverage, either the seller or the buyer can be the insured. If the seller is insured, this is referred to as a sell-side policy and if the buyer is insured, this is referred to as a buy-side policy. Buy-side policies make up the majority of the RWI policies in the US (up to 80%) because they provide key benefits that sell-side policies lack; namely, coverage against seller fraud and also the ability for the buyer to pick the survival period (defined below) which is typically beyond what the seller is willing to give in a customary sellers’ indemnity. The premium (defined below) can also be paid by either or both parties. In non-competitive deals, I most often find that the seller agrees to pay for a buy-side insurance. The buyer will be the insured and the party engaging with the insurance firm but it would be the seller that pays, typically through a purchase price reduction. Policy limit or coverage: This limit is the dollar value of the insurance coverage the buyer (or seller) would receive from the insurance company—a typical policy limit is about 10% to 20% of the purchase price. Retention: This works similarly to a standard insurance deductible such that a specific amount of losses must be incurred before the insurer’s obligation to pay claims under the policy is triggered—typical policy retention is about 1% to 3% of the purchase price. The retention obligation is often shared by the buyer and the seller as a way for the insurance company to ensure both parties have money at risk (see example below). Survival: The survival period is the term of the insurance policy. Under a buy-side RWI, the policy generally offers a survival period of 12 to 18 months, which goes beyond the typical indemnity package, with three years for general reps and warranties and six years for basic reps and warranties and for tax-related issues. As a practical insight, note that as the survival period under the buy-side policy typically extends beyond the survival period under the transaction agreement, the buyer should be able to obtain a drop-down, or reduction, in the policy retention amount once the survival period under the transaction agreement has terminated. Standard exclusions: These are found, in some manner, in every RWI policy. They include purchase price adjustments, forward-looking warranties, breaches of which the buyer (or seller) had actual knowledge (anti-sandbagging provisions), any items on the disclosure schedule, or unfunded/underfunded benefit plans. Transaction-specific: These exclusions typically fall into two categories: (1) as a result of a gap in the buyer’s due diligence or a known issue which was discovered from the diligence underwriting efforts or (2) a representation or warranty that it is too broad, making it too difficult to underwrite. The pricing is composed of two elements: the premium and underwriting fees. The premium is expressed as a percentage of the policy limit or coverage defined above. Currently, premiums are running at 2.5% to 3.5% of the policy limit or coverage. For example, a $10 million limit would mean a $250,000 to $350,000 one-time payment. Note that minimum premiums are running at $150,000 to $200,000; therefore, I don’t recommend rep and warranty insurance if the insured is seeking less than $5 million of coverage. Underwriting fees are running at between $15,000 and $30,000. The example below shows the interplay between all the elements and illustrates the main benefit to the seller; namely, more purchase price proceeds at closing. The following example comes from Equity Risk Partners. Assume that the purchase price is $100 million. Below are two scenarios—one showing the transaction with no insurance and the other showing with insurance. Further, the “no-insurance” case assumes that the customary seller indemnity is 10% of the purchase price (or $10 million) and assumes that the buyer’s non-tipping basket is 0.5% of the purchase price (or $0.5 million). The “with insurance” case assumes that (1) the retention (or deductible) is 1% of the purchase price (or $1 million) and it is shared by the buyer and seller equally, (2) the policy limit or coverage is 10% of the purchase price (or $10 million), and (3) that the premium is 3% of the policy limit (or $0.3 million). Let’s take the “with insurance” scenario above and run it through a real example to illustrate who pays for what in the case of a rep and warranty breach. Suppose that the buyer submits a claim to the insurance company for a rep and warranty breach and that the loss is quantified at $2 million. The insurance firm concludes that there is enough evidence to validate the breach and the quantification of loss at $2 million. The buyer receives a total of $1.5 million because the buyer needs to meet the first $0.5 million as the retention or deductible. The $1.5 million is composed of (1) $0.5 million from the seller as the seller is covering half of the retention or deductible, and (2) $1 million by the insurance firm. The objective of this section is to illustrate the interplay between the RWI insurance policy and the acquisition agreement. Provisions related to RWI insurance are generally added to the covenants/closing conditions, the source of recovery/indemnification provision, and insurance collection efforts. Sometimes, sellers remain liable for certain negotiated liabilities above the RWI policy coverage amount when the retention and the RWI insurance policy limits are exhausted. If this is the case, the indemnification provision in the acquisition agreement should then be revised to require the buyer to seek indemnity payments from RWI policy before seeking payment from the seller. The process starts with either the buyer or seller (or both) expressing the desire to have RWI. Then, the parties will reach out to an insurance broker to discuss the transaction details and the goals of purchasing the policy. The insurance broker will then collect some basic information on the transaction; namely, (1) the sale and purchase agreement (the first draft is fine), (2) information memorandum and any other materials describing the seller, and (3) financial information from the seller. Armed with this information and the insight from Step 1 above, the broker will contact insurers who will then submit non-binding indications of interest. The buyer will then pick an insurer and will pay an underwriting fee of $15,000 to $30,000. After this, the insurer will commence the underwriting process and will request access to additional information, e.g., access to the data room, advisor reports (e.g., accounting, tax, legal, etc. ), and all updated transaction legal documents. Then, the insurer will organize a call or meeting between the insurer and the buyer with specific follow up calls with the individuals responsible for the due diligence. The insurer will provide a first draft of the insurance policy with the important set of exclusions; namely, the reps and warranties that the insurer is not willing to cover. At this point, the negotiation process starts whereby the insured will either provide more information or revise the rep and warranty (e.g., remove a single sentence or qualifier within the full representation), aiming at persuading the insurer to remove the exclusion or at least cover part of the warranty. The insured will want to have the insurance in place at signing or at closing. In order to achieve this goal, the insurance firm provides a binder which is a contract which legislates the obligation of the insurance firm to provide coverage only subject to certain conditions being met, e.g., receiving the final executed documents, etc. After closing, the insurance firm will receive all the information and payments which satisfied the conditions (e.g., payment of premium, receipt of all executed transaction documents, and all due diligence information). At this point, the insurance firm will issue the policy effective as of the date when the signing or the closing occurs. In a recent transaction, the seller, who was the owner of a family business passed on to him by his father, was extremely concerned about post-closing liabilities. The buyer, a private equity firm, asked for a very comprehensive reps and warranty schedule, as they were doing minimal due diligence. This sale was a once-in-a-lifetime event for the seller. He and his father had worked all their lives in the business and this was the chance to reap the financial benefits of their hard labor. Additionally, the seller, in his 60s, needed all sale proceeds to secure retirement and also secure his children’s financial futures. For these reasons, he wanted to ensure that he received the sale proceeds immediately and that there was certainty about the sale proceeds post-closing, i.e., no post-closing liabilities. The seller was willing to give the reps and warranties as he was very knowledgeable of the business but, as he put it, “one just never knows what these PE firms are going to find—they have entire floors full of lawyers.” I introduced the idea of rep and warranty insurance to the seller and he immediately loved it because, as he put it, “I am more than willing to pay a few hundred thousand dollars to buy peace of mind for my family and enjoy the sale proceeds in the millions.” In this particular case, I was able to negotiate with the insurance firm a very small retention amount which was fully covered by the PE firm. I believe that the seller wouldn’t have consummated the sale without the insurance. As he put it to me, “[I’d] much rather go on with the business than selling it but be worried about whether I can use all sale proceeds.” The above story is thus a great example of how financial innovation and the experience of how to use it allows for transactions to happen that wouldn’t have occurred otherwise. What is reps and warranties insurance? Reps and warranties insurance is a contract between the buyer (or seller) and an insurance company whereby the insurance company will indemnify for losses resulting from a breach of reps and warrants. What are representations in a contract? Representations and warranties are contractual statements where a seller asserts the truth and accuracy of a condition or circumstance of a business. They help determine the quality, nature, and risks of what is being acquired. If these statements aren’t true, the seller may be liable to pay damages to the buyer. How do warranties differ from representations? A representation is a statement of fact made before a contract is drafted which was used and relied upon by the by the buyer when assessing whether they wanted to enter into the arrangement. A warranty is instead a new statement of fact which gets included in the contract in question.